About Taken today during a thunderstorm. The fog rolled in and out all afternoon. Kinda liked this look. What do you think.. STUNNING!!!!! Love photos taken in the fog, but the problem always becomes having something to focus on. In your shot, that is not the case. The little lighthouse looks fantastic here. Love the composition and the fact that the lighthouse is all white with the only real color in this image being the red roof. Perfect. Just perfect. Congratulations on the award, well deserved. Glad it appeared on the front page. While you were away, this photo was Photo of the day for 2 days .I want to get some stuff up on the site soon. what size again do you say they should be ?? Beautiful work Jim and congrats on award. Amazing shot, well done Jim. To quote cousin Eddie from Christmas Vacation...It's a beaut' Clark! perfect composition..a beauty in every way. I think its a great shot Jim, Congrats on Pic of Day my friend!! absolutely beautiful! the fog, the duo tone! I love it!!! Compliments, big photo, an unreal atmosphere, very beautiful! Wow, what a cool shot this is .. the detached effect of the pier and lighthouse is great ! Lesson learned! Simplicity of elements within a composition really do strengthen it. The contrast of subject against the vaguerity of fog and the contrast of the red roof against the monochromatic mood of the image combine to make this a truly compelling image. Well done! Thanks for sharing! Thanks for inspiring! This is Awesome!! I love this picture. Absolutely AWESOME !!!!!!!! Wonderuful. Misty, moody and also so alone. I'll let you know if I am able to go, then we can go from there. Got a trip to see the grandaughter as well that could , WILL impact the trip if it is to be. Ps I have looked longingly at the chopper as well, wnder if it can get my carcass off the ground, would that be embarrasing.. Funny you mention that Jim. I have been thinking the same thing. I was gonna hike out and camp a night or two. If I have the cash I was thinking of talking the helicopter guy into a sunset or sunrise flight. I hope to get out there before tourist season gets going full blown. Maybe we should coordinate? thanks for the comment neighbor ! Good to hear from you , bet its warm over there. I am toying with the idea of a quick trip to the badlands in the next few weeks. Usually go to Wall and stay there. after 4 trips I finally got some decent photos last time. I like very much the mood. this has to be THE best image uploaded today!!!! Awsome shot JIm! Congrats on Photo of the Day! How very special! Jim, I think I may have to order a copy of this from you! It's fantastic!!! Write to me if you're willing to print up one of this for sale! That's the way the cookie crumbles sometimes ain't it Jim. You hit a blank then something great just pops up from nowhere. I had the same when trying to organise the recent UK meet. I wanted places to go that weren't to distant but would give a variety of subjects, one of which was going to be wildlife which just don't follow any instructions and don't turn up when required. As it turned out they were competing for attention. Boy, was I relieved. Congrats again on a marvellous capture. Thanks so much for your encouraging words. I was ready to take a sabatical yesterday, It seemed as though I had hit the wall. I went down to the breakwater to have lunch and "power Nap" and that is where I saw this. a few handheld shots out the window produced this image. I got seagulls in one of the shots, but it looked out of balance, crowded, so I settled on this one. i think that there is a strange feeling in this picture: a quiet power, a calm storm, a small shout. A nice shot without doubt, in his simplicity is a story. Compliments. Wow!! Absolutely brilliant shot, Jim!! So atmospheric and kina minimalist, but full of drama! Love this Jim, is it a straight shot? Really eerie. I think I might have placed the subject slightly lower in the frame though. CONGRATULATIONS Jim on POD. What a fabulous image. I find it so peaceful and relaxing and atmospheric. It has such a dreamy feel to it that I can well imagine it in a classy frame hanging on my lounge wall. goregerous capture! and really happy to see u on the MP! without words dear jim, but i'm many many happy for your fantastic photo "on award"..
just deserved, but is so simple and so magnific light atmosphere! is.. is .. similar to a fog's sea..
Nice one, glad to see it chosen POD. Nicely composed unique shot. I love the foggy atmosphere. Looks like a perfect place to escape normal life and relax and start listeing to yourself again. what simplistic beauty! A real work of art. a grand shot dear Jim!!!!!!!! perfect in all aspects!!!!!!! congratulations for a well deserved award!!!!!!!! I like it, Jim, and apparently so did others! Congratulations on your Photo of the Day! A very well deserved, and overdue, award! I like the surrealist look this image has. Well done! Congratulations Jim...knew this was a powerful shot ! And this is FANTASTIC!!! with all the fog over the frame and leaving the lighthouse (is it?) appear, makes a really beautiful picture! Two thumbs up!!! Beautiful shot,I like also the mood given from the low fog.Congrats. Perfection Jim! Absolutely fantastic... The subtle hints of color with the surreal lighting make this picture! Well done, Again! This photograph is artistically perfect! 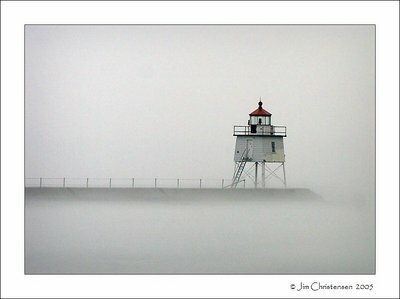 I adore how you have captured the essence of mystery with natural fog and the blank white background tends to add focus on the lighthouse itself and the over emphasized simplicity of the photograph makes it even more interesting. I am sold on your work as a supporter. Keep up the fantastic work! Sweet Jim....I like this shot a bunch, love the fog look. This stuff gets me all excited, to my favorites. its so powerful! powerful in its simplicity!!!! the whole atmosphere is very moody and surreal!!! the out of nowhere...a splash of red...it captures our attention with no intenttion of letting it go!